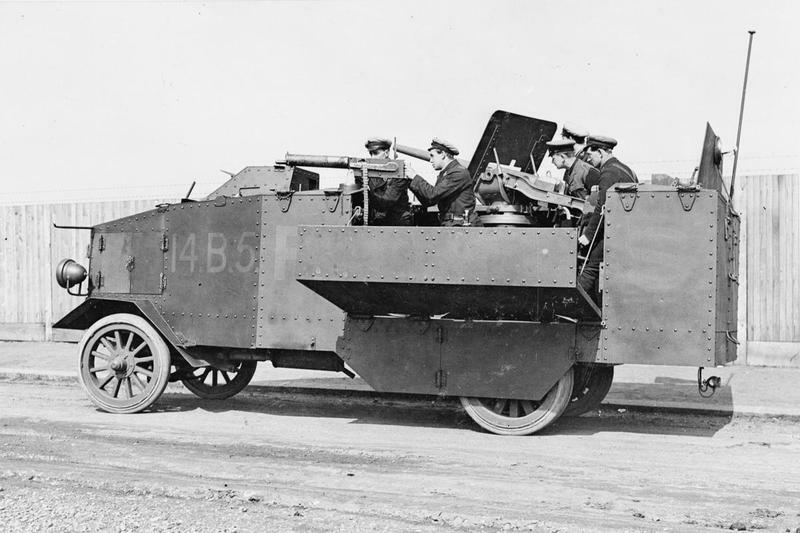 Hotchkiss 3-pdr and machine gun being used on an Armored Lorry. IWM Photograph Q 14633. Hotchkiss 3-pdr guns were introduced in 1886 for locations where the 6-pdr gun was considered to be too heavy. Used as anti-torpedo boat guns on most small cruisers built prior to World War I. As did other nations, the British found that these small-caliber projectiles were too light to be effective and many guns were converted following World War I to sub-caliber training and saluting guns. This last use meant that a number of these guns survived until World War II when they were converted back to shooting guns and used on MLs and other minor auxiliary warships. An approximate total of 2,950 of these guns were in naval service, with about 1,950 of these still available in 1939. Mark I was of monobloc construction while the Mark II was a built-up design. Almost all surviving guns in 1939 were Mark I. ^During World War II, outfits were all HE, although some common rounds were used during the early part of the war. Flashless was issued in the latter part of the war. ^1.11.2Marks I, I* and IV were pre-war and World War I mountings. ^Marks V and VI were produced during World War II. ^The Mark VI used rubber recoil buffers. ^Some Mark I mountings were converted to HA types and then designated as Mark IC HA. These had an elevation range of -8 to +60 degrees. 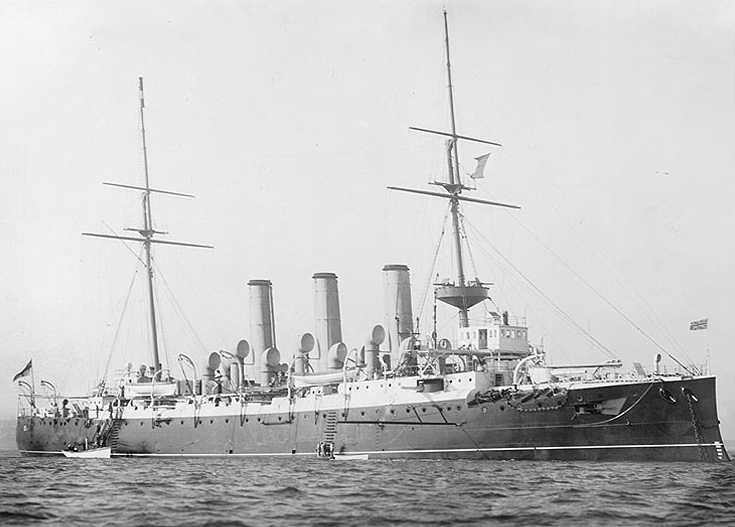 HMS Furious in 1898. Two 3-pdrs are in the fore-top. U.S. Naval Historical Center Photograph # NH 61062. 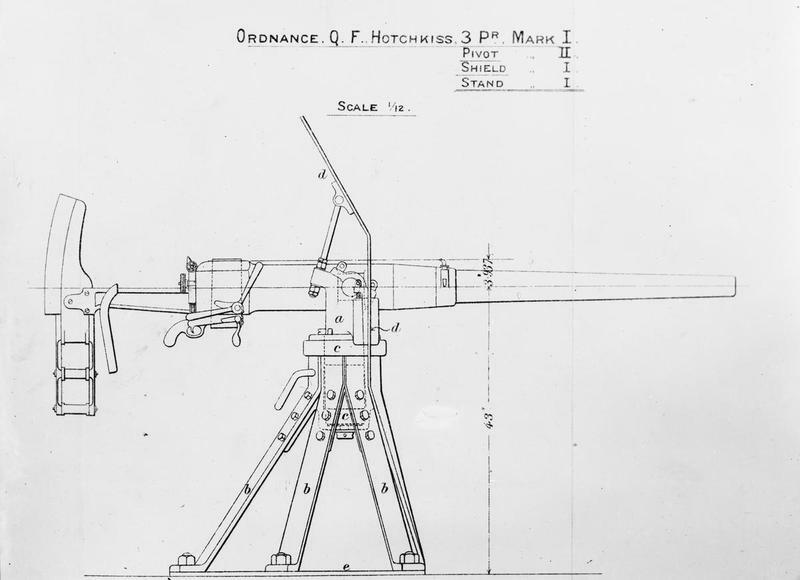 Hotchkiss 3-pdr sketch from Plate VIII in "Handbooks. Q .F. Gun" dated 1904. IWM photograph Q 65539.